Crisp. Clean. Smooth. A DREAM TO WRITE ON – your pens and pencils glide over the recycled 100 GSM pages and your ink won’t blob or soak through. Soft off-white coloured pages. Acid-free paper for years of life. SPACIOUS 9.75″ x 7.5″ size and 160 pages. You’ll be organized with a DOT GRID pattern on the left side and WIDE LINED on the right side. Durable thread-bound binding – your notebook stays flat for writing and drawing. ELASTIC CLOSURE and BOOKMARK in contrasting colour. Room for extras in the EXPANDABLE INNER POCKET. All pages perforated for quick removal. Cool and contemporary format in 4 beautiful on-trend colours. Note taking. Idea jotting. Action planning. PRODUCTIVITY AND CREATIVITY without distractions of technology! Enjoy using this quality journal to engage your brain differently – get smarter and more effective! TOP journal, planner and organiser that’s BEAUTIFULLY packaged and presented – the perfect GIFT. Whether you’re at school, in the office or at home this is the GO TO notebook for all of your projects and endeavours. Limited Time Promo Code – PAIPUR05 – take 5% off if you order 2 or more today! 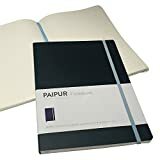 If you need a 2nd Brain, using the PAIPUR Notebook helps you think better, and create more. Laying down ink on paper, you work very differently from using a computer. It’s intuitive, deeper, personal. As the digital world expands, paper notebooks are becoming MORE popular. Yes, you read that correctly. Demand for creative paper notebook journals is currently red hot!! For many people, the stuff that really matters goes onto paper. Your ideas are expressed with a richness that’s possible by scribbling, doodling, noting, crossing things out, circling things, and sketching out diagrams. Pure freedom of expression! The PAIPUR Notebook will unlock your potential to be SMARTER! Research by Oppenheimer and Mueller demonstrated much greater levels of engagement with content recorded in a writing journal compared to content recorded on a computer … so the simple act of writing and drawing by hand literally makes you smarter! – Dual format pages. Dot-grid pattern on the left side and wide rule pattern on the right side. Because different formats help you to think in different ways. – Each page has 4 small squares in each corner. Perfect for indexing, color coding, ticking off, numbering, action symbols and a whole host of creative uses. The PAIPUR brand was created to develop beautiful creative paper goods. It’s a small family run business and we make every effort to delight our customers 110%. The Notebook is available in 4 colours – ‘Breakthrough Red’, ‘Blue Clarity’, ‘Exploration Blue’ and ‘Invention Orange’. The elastic band, bookmark, and expandable pocket detailing is in a contrasting colour for a visually appealing modern vibe. We hope you love it! Don’t wait any longer to enjoy the freedom of ink on paper – Order Now! INSPIRE NOW JOURNAL - A5 Daily Productivity Planner, Daily Organiser, Weekly Planner, Set and Achieve Your Goals, Get Things Done. This entry was posted in Luggage and tagged 19cm, 25cm, Best, Bleed, Classic, colours, Dotted, Gift, Grid, Journal, Large, Luxe, Notebook, PAIPUR, Paper, Pens, Premium, Ruled, Softcover, Style, Thick by Perfect Vacation. Bookmark the permalink.